For a limited time, the majority of Telltale's iOS catalog is heavily discounted to 99 cents an episode. Just when you thought the zombie craze might finally be slowing down, Telltale's The Walking Dead shambled onto the scene. The episodic adventure game based on Robert Kirkman's comic book not only provided a unique take on the well-trodden genre, but quickly became one of Telltale's most popular games to boot. Anyone hoping to play the series now has many platform options to choose from, including the recent retail release for consoles, but iOS users may have the better deal. For a limited time, the first episode of Walking Dead is completely free through iTunes, while the Episode 2-5 multi-pack can be snatched up $14.99. 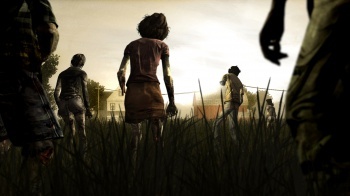 The iOS version of Walking Dead is identical to console and PC versions, except for a UI designed with touchscreens in mind. I haven't played the iOS version myself, but I imagine a touchscreen would be very useful in Walking Dead's case. Not only is it well-suited for adventure games, but it should be easier to react to quick-time zombie attacks with a finger swipe than a spontaneous mashing of the Q and E buttons. It's not clear how long the deal will last, but if you happen to own an iPhone or iPad, it's pretty hard to beat the price of free. And if zombies aren't enough for you, most of Telltale's iOS catalog is on sale as well. Almost all individual episodes of titles like Back to the Future, Hector, and Sam & Max: Season 2 can be snatched up for 99 cents each. Whether you're in the mood to make difficult, life-altering decisions for your survivors, or simply catch up on some classics, Telltale seems to have you covered for the immediate future.